Life is never what it seems. One night changed everything, one night tied them together for eternity. Can they survive the fight? Can they ever be free? What an amazing story! Skin’s is a complete work of art. I loved every minute of this story, even as the story drew to a close I was desperate for there to be more, so much more, because I wasn’t ready to let these characters go. 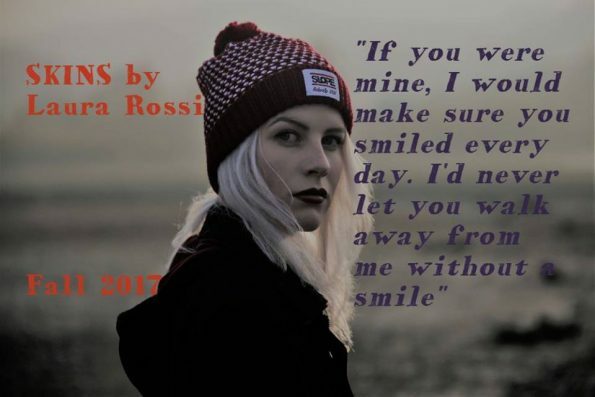 Laura Rossi has an amazing talent, she kept me captivated throughout. I honestly never wanted to put this book down. I found myself so invested in Sebastian and Angela’s story, I felt as though I was living this nightmare along with them; fighting with them every step of the way. This story is one that has you sat on the edge of your seat, waiting with abated breath for what’s going to happen next. Laura surprised me again, and again, with this story, she puts you through one hell of an emotional rollercoaster. I very nearly threw my kindle in utter shock at what was happening before my very eyes, to then have another twist hit, finding myself loving her, and her beautiful words, all over again. Sebastian stole my heart with this story, he was an enigma, one that you want to know more about, you want to get into his head, and when you do, you never want to leave. The passion, and strength, he had was simply beautiful. Andrea was tough, the life she was living, was terrifying, and yet she found the strength to go on and keep fighting for her freedom; she was simply amazing. Skins is a story I won’t ever forget, and a story that will impact me, each time I read it. This is a must read for all romantic, suspense readers, who like things on the dark side.